History Detectives goes to the heart of Manhattan to investigate a tiny portrait which may lie at the center of some very big history. It’s spring, 1789 and 20,000 Philadelphians pack the streets to catch a glimpse of their nation’s leader en route to New York. First in war and first in peace, George Washington has been elected President and as his inaugural procession forges north, America celebrates freedom from British rule. But for the thousands of enslaved African Americans watching the parade, liberty is nowhere in sight. If President Washington won’t pave their way to citizenship, who will? Dave Cox of Greenville, Ohio, has stumbled across a miniature color painting of a man in profile labeled “G. 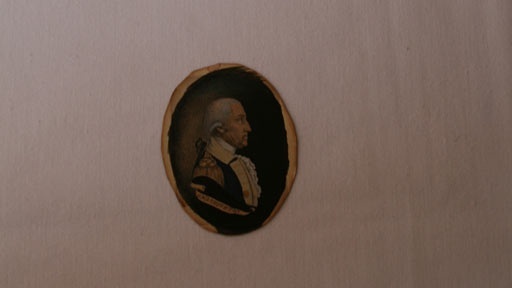 Washington.” On the back of the portrait is the inscription, “Property of White Matlack, New York, 1790.” Did the artist paint this portrait of Washington from life, and what is its surprising connection to the little-known abolitionist and patriot, White Matlack? Also in Season 7 Tokyo Rose Did this 1940s recording help convict the woman alleged to be "Tokyo Rose"? Related Investigation Philadelphia Freedom Paper Is this document found in a flea market an original freedom paper for African-Americans? Also in Revolution: 1754-1820 Rebel Whiskey Flask Is this flask a relic from the historic "Whiskey Rebellion" of 1794? Also with Wes Cowan Survivor Camera Did this antique camera save a Polish Jew during the Holocaust? Also with Wes Cowan WWII Diary Does this diary hold the key to understanding the fate of a missing bomber pilot from World War II? Also with Wes Cowan John Hunt Morgan Saddle Could this be a saddle from one of the most audacious attacks launched by the South during the Civil War? This is a place for opinions, comments, questions and discussion; a place where viewers of History Detectives can express their points of view and connect with others who value history. We ask that posters be polite and respectful of all opinions. History Detectives reserves the right to delete comments that don’t conform to this conduct. We will not respond to every post, but will do our best to answer specific questions, or address an error.